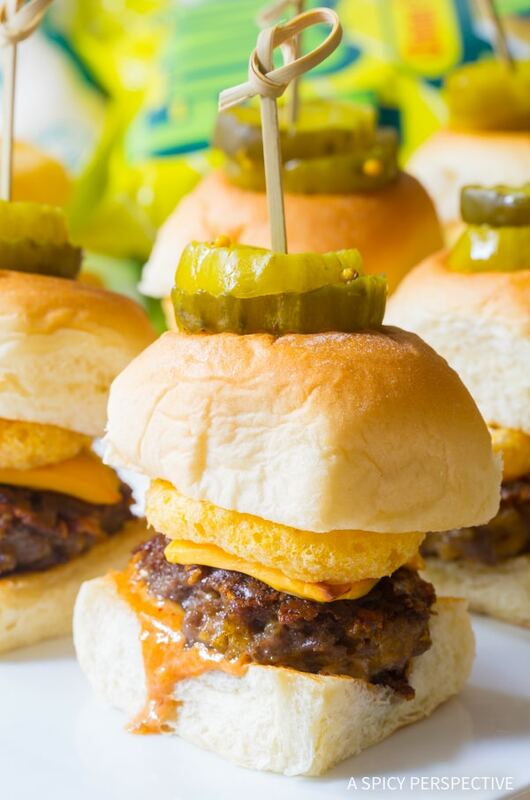 Cheesy Funyuns Sliders, a zesty party snack for summer, with a crunchy kick! Disclosure: This post is sponsored by Frito-Lay. All opinions are my own. Summer cooking can be so much fun. Care-free foods with tons of personality seem to rule the warm-weather months. 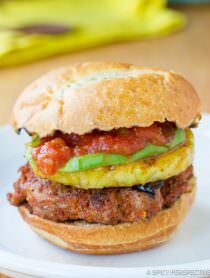 We love combining comforting favorites, like burgers and barbecue, with an unexpected ingredient or two. 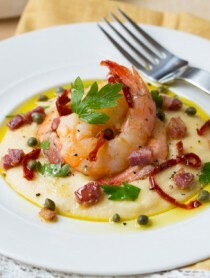 It makes classic meals just a touch more exciting! 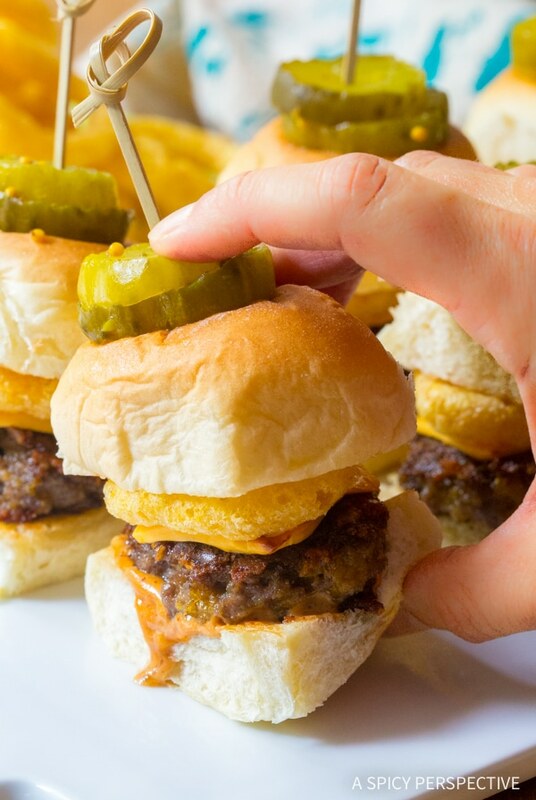 Today’s Funyuns Sliders are a lively twist on traditional mini burgers. Funyuns have been a favorite snack of mine since childhood. I remember eating them at the neighborhood pool with a lime soda, every summer of my adolescence. I still get excited over Funyuns every time I pass them in the grocery aisle! At parties and family movie nights, the zesty onion flavor and tantalizing crunch of Funyuns keeps everyone coming back for more. Since Funyuns resemble breaded onion rings in both taste and appearance, I thought it made perfect sense to add them to sliders. 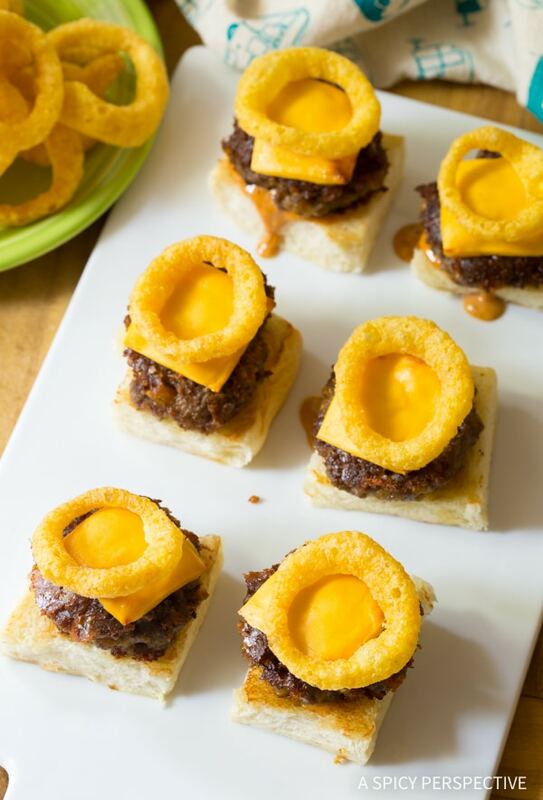 Our Funyuns Sliders have crushed Funyuns mixed into the ground beef patties to add a boost of flavor. The Funyuns crumbs offer a second purpose as well. They help retain the juices in the patties, so the burgers are ultra moist. We placed the patties on small yeast rolls with cheese, tangy barbecue-mayonnaise, sweet pickles, and of course more Funyuns on top for crunch. 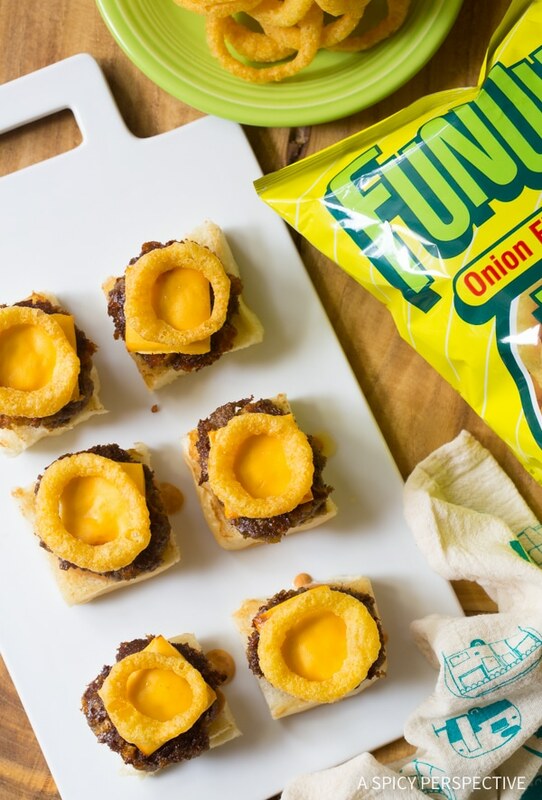 As if the allure of itty bitty cheese burgers wasn’t enough, the pop of onion flavor and brilliant crunch-factor the Funyuns provide make these little Funyuns Sliders a guaranteed crowd pleaser. This savory-sweet combination is an absolute delight at summer gatherings. 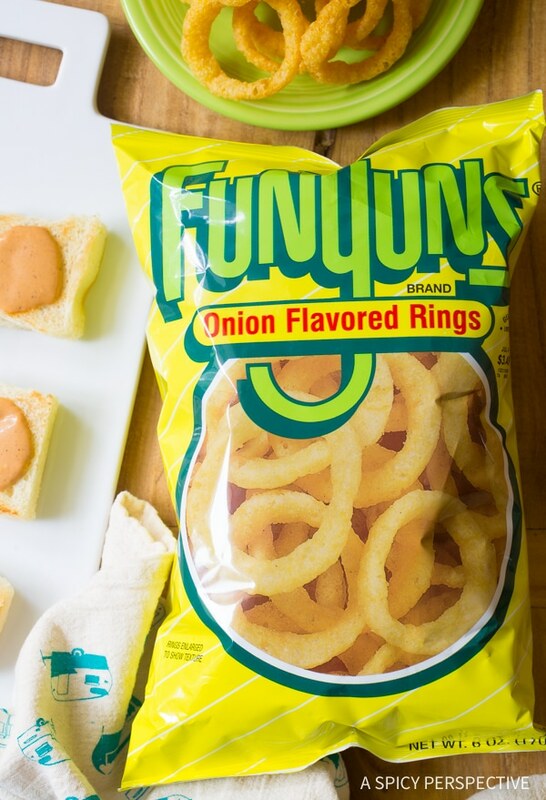 Like the idea of Funyuns on and in sliders? 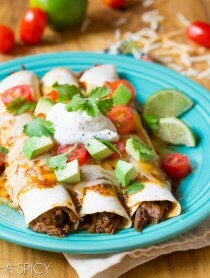 Also try them in grilled cheese sandwiches, as a topping for casseroles, and instead of chips in nachos! 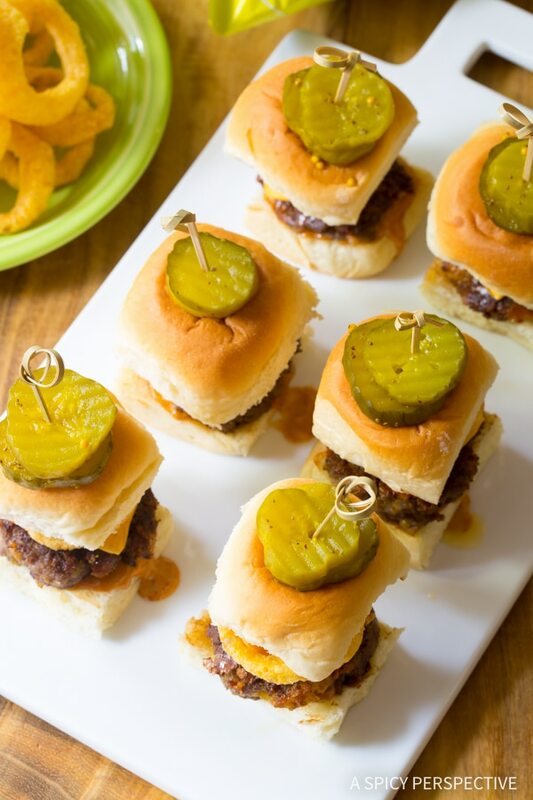 Funyuns Sliders Recipe - A fabulous cheesy beef slider recipe with a boost of flavor from crushed Funyuns! These little sandwiches make tasty party snacks. 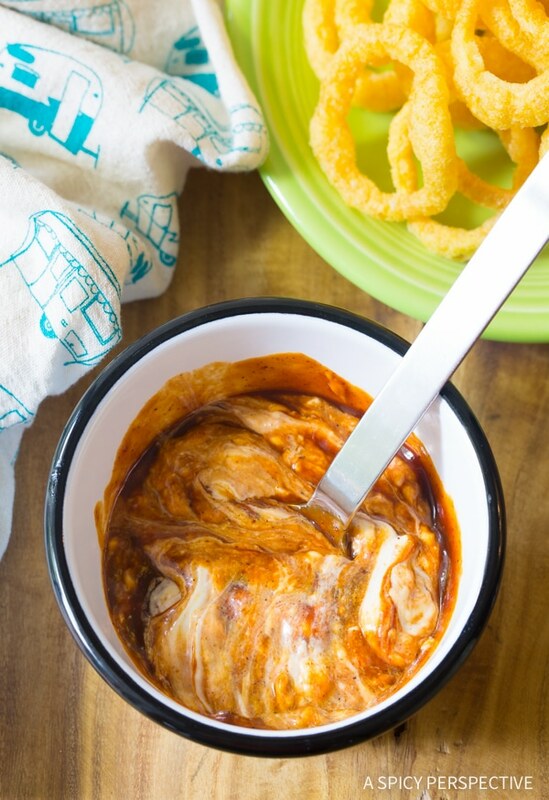 In a small bowl, mix the mayonnaise and barbecue sauce together until smooth. Cut the rolls open for sandwiches. Then cut the cheese slices into 4 squares, 20 total. Remove 30 Funyuns from the bag and set aside. Crush the remaining Funyuns, in the bag, into crumbs. You should have about 1 1/2 cups Funyuns crumbs. Preheat a griddle (or grill) to medium heat, between 375-400 degrees F. In a large bowl, mix the ground beef, shredded cheese, Funyuns crumbs, 1 teaspoon salt, and 1/2 teaspoon crushed red pepper. Mix well. Then use a 3 tablspoon cookie scoop to portion out 20 balls. Flatten the balls into patties, 1/2-inch thick. If using a griddle, butter the griddle and toast the interior of the rolls for 30-60 seconds, until golden. Remove the rolls. Then butter the griddle again and add the slider patties. Cook the patties for 3 minutes. Then flip, add a small cheese slice to each patty, and continue cooking another 3 minutes. *If using a grill, skip the butter for both the rolls and the patties. Meanwhile, place a small dollop of barbecue mayo to the bottom portion of each roll. As the cooked patties come off the griddle, place a patty of each roll and top with another Funyun and a sweet pickle. Then cover the sliders with the roll tops. Serve warm. NOTES: I stacked my pickles on top of each slider with a party pick, just for kicks! 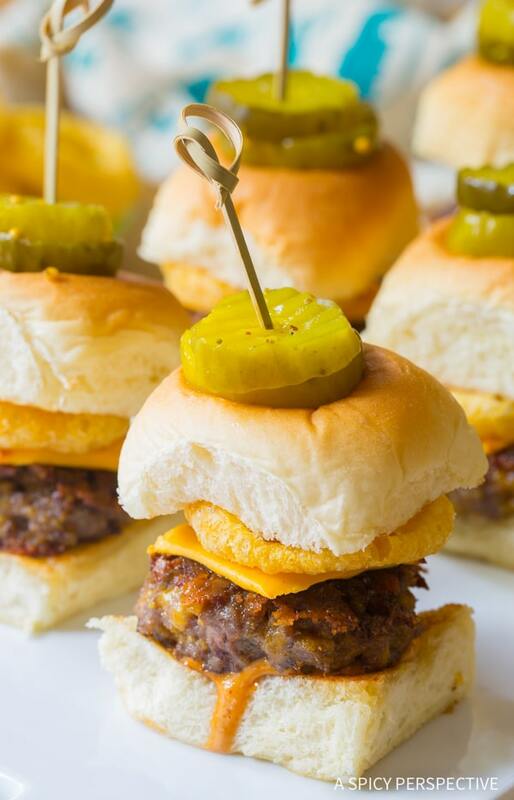 LOVE the funyun crunch on the sliders. And the sauce is delish too! I love Funyuns also, I always chose that bag when grocery shopping with my mom! I don’t’ see them as often anymore, but next time I do I am definitely buying a bag and making more sliders! These are always such a hit at parties! That unexpected crunch is addictive. 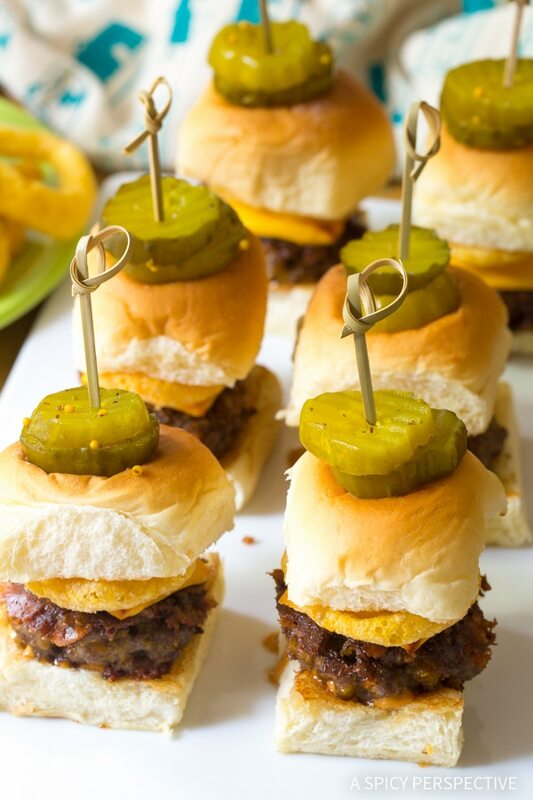 These little sliders will be perfect for a Super Bowl party! Oooh wow these look soo good and I am now hungry I will be putting this on my menu for the next week thank you. OMG! Love the thought of these bite sized summer treats!! Yum! Send me a tray full to inhale! My husband would lose his mind over these! My boys will go crazy for these tiny burgers! Holy wow, Sommer! These look just fab. Funyuns are one of my favorites, but I can’t remember the last time I had them. This is going on my “to-make” list! OMG- those look really good Sommer!